Live and let dye? Not any more, declares proud Macca, 76, after finally ditching the hair colouring ... . Beatles Radio: The Beatles, Solos, Covers, Birthdays, News The Fab 4 and More! For years he has refused to accept that his trademark locks have been turning grey. But Sir Paul McCartney has finally ditched the dye and shown off a more natural look. The singer, 76, had grey hair framing his face, rather than his usual brown, when he appeared on US chat show The Tonight Show with Jimmy Fallon. 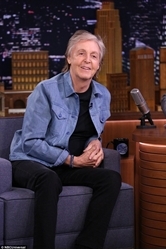 Dressed in a black T-shirt and jeans with a blue jacket over the top, Sir Paul appeared totally at ease with his new appearance. The star, who is promoting his new album Egypt Station, also filmed a social media video with his whiter locks on display. Just months ago, he was still showing off a head of dark hair – although in January he had allowed a hint of grey to show through on his sideburns, perhaps as a first step towards a more natural look. On Friday Sir Paul gave a secret concert at New York's Grand Central Terminal for invited guests including Meryl Streep. Commuters could not see him but could hear his 24-song set.